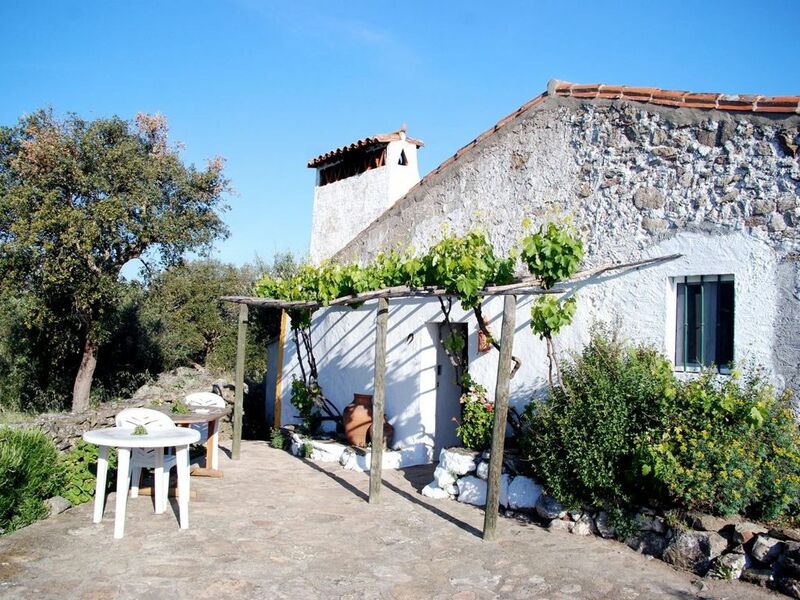 This stone built cottage is the original property on the 130 acre Tapada do Falcao Estate. It lies some 500 metres up a track off the drive to the main house, and is totally hidden from view. It has been sympathetically renovated and furnished with traditional hand painted furniture. It abounds in rustic charm and has wonderful views from its terrace. It may be let separately or in conjunction with the larger Tapada do Falcao (see separate listing). The cottage lies within 130 acres of woodland and pastureland abounding with cork oaks, eucalyptus and umbrella pines. Indigenous shrubs and flowers flourish in their natural state. A small vineyard was planted in 2000. From the wild flower garden and terrace of the cottage are wonderful rural views over hills and valleys. There is a tennis court on the estate which cottage occupants share with the main house. Despite its peaceful and secluded position, it is possible to walk to the small local village in under 10 minutes. There is a wood burning stove and additional gas-powered portable heater. There is a lot of space around the cottage for exploring, but no formal garden. Peaceful terrace with table and umbrella, offering wonderful views across the countryside to the vineyard. There is a tennis court on the estate which you are welcome to use. The living area of the cottage has a vast Alentejan fireplace containing a wood burning stove (free logs). One single bed is located on a sleeping gallery above the dining area and is reached by a sturdy, fixed ladder. It therefore lacks a certain amount of privacy and is not suitable for the elderly or the very young. There is a tennis court on the estate and occupants of the cottage share its use with those in the main house. The property is ancient, rustic and peaceful, nestled down a long track away from the main house. The four of us - Mum, Dad, 21 year old and 14 year old felt the house accommodated us comfortably. Jaoa the caretaker spoke fabulous English, and gave us great advice. The information folder and leaflets in the cottage were also invaluable. The kitchen was adequately kitted out so we often cooked at home. Eating out was reasonably cheap and great value, as well as serving excellent food. One thing definitely needed is a car, to enjoy the region fully. The cottage doesn't have a pool, but the nearby municipal pools were gorgeous, and very well maintained. We made the mistake of hiring bikes from the estate in August, forgetting about the thirty five degree heat! However the bikes were really well maintained, so they would be have been great at any other times of the year. Thank you so much for taking the time to write this review. We are so pleased you enjoyed the cottage and the surrounding area and hope to welcome you back sometime! The property was as described on the website. Facilities were quite basic but it had everything you need, was comfortable and had great charm and character. The booking process was very straightforward and the owner was very helpful, replying very quickly to email enquiries in a nice friendly manner. Directions to the property were very clear, but it's very easy to get to and we took our own route, seeing some interesting countryside on the way. The caretaker's son, who speaks flawless English, was extremely welcoming and helpful when we arrived; indeed, people we met everywhere were charming and friendly. The casa was very secluded and private with a lovely view across the owner's vineyard to distant hills. Eagles, bee-eaters and nightjars were plentiful?the area is famed for its birdlife. Sitting under the vine on the terrace during the heat of the day, with or without a glass of wine, was very relaxing, and the night sky was spectacular. We didn't eat out but got to know the local supermarkets pretty well. They were extremely well-stocked with everything you could possibly want and had a massive selection of excellent Portuguese wines. The owner's wine is also very good if you enjoy red?there was a complimentary bottle when we arrived. There are many interesting and picturesque hill villages and towns in the immediate area, which are delightful to explore, as well as plenty of Roman and megalithic remains. This part of Portugal is less visited than most so there were no crowds and the atmosphere was tranquil. Distances to various historic towns further afield always seemed surprisingly short, an impression reinforced by the almost deserted and excellent roads. These have been transformed since my last visit to rural Portugal in the 1990s. Elvas is easy to get to and well worth a visit, Evora is quite close and the Spanish border is very near. Much is written about Portuguese drivers but they are about on a par with others in southern Europe?sometimes slightly psychopathic, but fine if you keep out of the way! It's worth checking out the Via Verde electronic toll system, which hire companies will activate for you when you pick up your car for a small extra charge. We found it worked very well. You don't need it on the motorway from Lisbon, but if you want to go further afield you might encounter one of the new electronic-only toll routes. There's plenty of information on the web about it. Have a great stay! We did. This lovely cottage is, according to the charming and fluently English property manager Joao, 300 years old and the house where he was born. It is an absolutely charming cottage with many artifacts from its past eg.a bread slip, a shepherd's crook hung from the walls. The lovely large fireplace kept us warm in the evenings (April) as we relaxed in the spacious living/dining room. The bedrooms are adequate in size and comfortable. The kitchen is well equipped. The bathroom offers a shower but lacks a tub . . . not a great inconvenience for us but may be a consideration for others. We enjoyed many a peaceful hour out on the patio nibbling egg tarts and local cheese, sipping port or the wonderful, full bodied wine from our hosts vineyard. A vineyard, I'd like to add that provided me with many gorgeous photos taken from this very same vantage point . . . an absolutely wonderful view. It takes only minutes to get to Portalegre for shopping, sightseeing or a meal out. We found many lovely hill towns to see and trails to walk in the area. We really enjoyed this restful retreat after long days of sightseeing and hiking. If you go in the spring an abundance of gum sistra and wildflowers awaits you. A very peaceful location, with wonderful views and a 'sun trap' terrace! Fantastic walking routes which were well signed, all offering something different. Many local attractions. Portalegre offers good amenities, large supermarkets and good value for money. To get by, you do need to speak a little portuguese though! The cottage offered spacious accommodation, loads of hot water and cooking facilities. The wood burning stove and bottle of home produced wine offered warmth on the cooler nights! The only negative comment is that the blankets could do with a little upgrading and the addition of a microwave would be useful, but this did not spoil our enjoyment at all. Would recommend to others looking for rustic charm, peace and excellent touring opportunities. Casa do Outeiro is situated on the Tapada do Falcao estate, on the edge of the village of Caia and about 8 kilometres from the town of Portalegre. The estate lies on the fringes of the Sao Mamede Natural Park and close to the border with Spain. This is one of the most beautiful and unspoilt corners of Portugal. The area is steeped in history and there are many castles and other ancient remains to visit. On the doorstep is the Sao Mamede Natural Park, a haven for many of Europe's rarest birds and animals. There are a number of dams and reservoirs for swimming, as well as outdoor public pools.